Background: Many diseases are associated with imbalanced fluid pressure regulation mechanisms. For example, normal pressure hydrocephalus or hepatic hypertension impose permanent or transient parenchymal pressure alterations which are hard to detect by conventional imaging methods. MRE, sensitive to mechanical constants of living tissue, may offer a way for the early and noninvasive detection of such pressure-related diseases. Problem: Being composed by about 75% water, biological tissue is normally regarded incompressible. Classical MRE relies on the shear elasticity of biological tissue which is independent of the bulk modulus and compressible properties of the tissue. Considering biological tissue as a bi-phasic medium composed of incompressible parenchyma permeated by fluid filled pores provides the link between compressibility and tissue pressure in biological soft matter. Restrictions to the fluid motion due to high dynamics (e.g. in ultrasound) or by confined boundary conditions yields a compression modulus of soft biological tissue in the range of Giga-Pascals (about thousand times higher than the shear modulus). Proposed solution: 3D displacement fields as usually induced in MRE combine both shear and compression wave fields. We measure the compression wave field by an adapted fast MR imaging sequence and apply the divergence operator to the field. The irrotational field displays pure compression which is not zero in living biological tissue due to the aforementioned poroelastic properties. 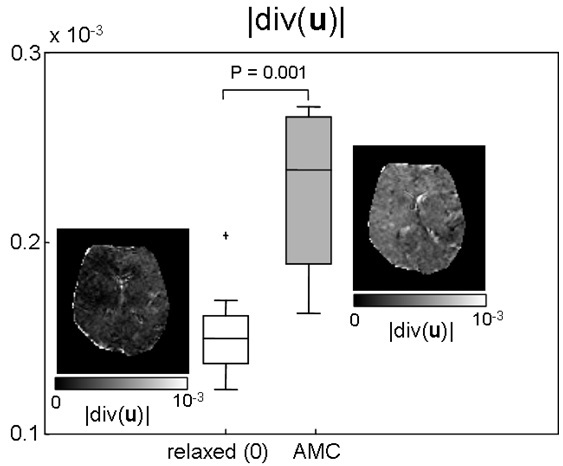 In human lung we observed significantly higher strain amplitudes in inspiration than in expiration, reflecting the influence of the intrapulmonary air volume on the mechanics of lung parenchyma. Moreover, induced volumetric strain was quantified in the human brain. Volunteers were asked to sustain contraction of the abdominal muscles during the first experiment, thus hindering venous outflow of blood from the brain and hence increasing intra-cranial fluid pressure. This state was compared to the physiologically normal, relaxed state. Strain amplitudes in the high-pressure state were clearly elevated. Similarly, the influence of cardiac pulsation on brain mechanics was analyzed by means of ECG-gated data acquisition. Further studies will be performed to assess the diagnostic potential of pressure-sensitive MRE for in the context of different pathologies. Figure 1: Spatial maps of induced volumetric strain (dimensionless) in the lungs of one volunteer. Inhalation (left) shows a higher proportion of high amplitudes than expiration (right). Figure 2: Averaged volumetric strain (vertical axis) in the relaxed state (white box) and under abdominal muscle contraction (AMC, right). The significantly increased volumetric strain amplitude for the latter state is also clearly perceivable in the spatial strain maps.